This winter, mother nature came in like a wrecking ball — or whatever. And truth is, while we’ve enjoyed the cold quilty months, we’re ready to put our sandals on and hang our quilts outside to dry or picnic on top of them instead of burrowing underneath these dudes in search of heat. Being inspired by spring, the staff of Crimson Tate created their own bundles to beckon spring through the doors. It’s time to dust off the gray and welcome color back into our world. Here are the selections we came up with. Let us know what you think and certainly let us know whose spring-time mix is most appealing to you. This is what he has to say about his bundle. This is what she has to say about her bundle. Welcome spring with this fresh, bright bouquet of colors! This lovely bundle features beautiful fabrics from Echino Decoro, Amy Butler’s Hapi, Lizzy House’s Pearl Bracelets & Catnap, Lotta Jansdotter’s Mormor, and Ellen Luckett Baker’s Garden. These colors will surely brighten your next sewing project! This is what I have to say about my bundle. Eclectic, vintage, Japanese. 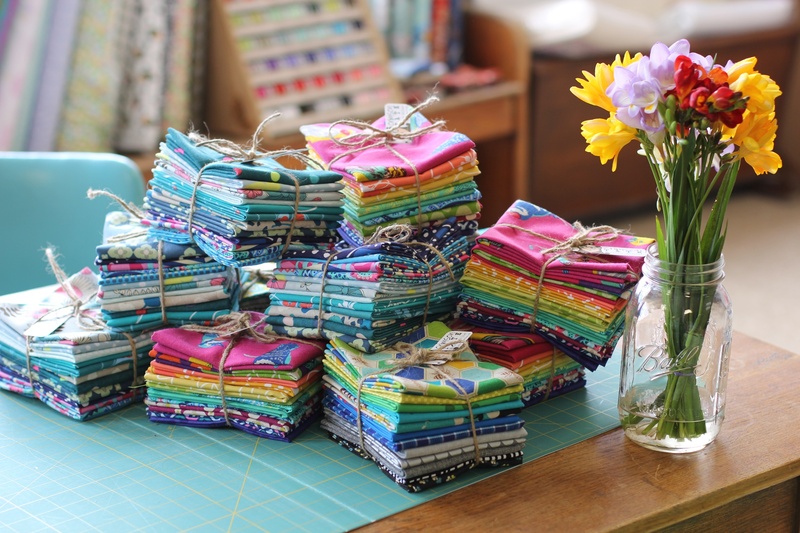 Many of these fat quarters are cotton linen blends and of Japanese design with a vintage kick. Currently, I’m obsessed with teals that turn into blues. What you’ll find in this mix is a range of values from deep saturation of color to incredible low volume as evidenced in Lizzy House’s Catnap fabrics. I gave this a pop of hot pink to welcome in the spring and the return of color in our landscape. C’mon in warm weather, we’re waiting for you. Which bundle do you like the best? We’d love to know whether you’re down with blues and grays with a masculine slant. Or if you prefer a saturated rainbow of color explosion. Or if you’d like to ride on the tranquil seas of blueish greens. We’re curious your opinion. That brings us to, we are looking for some extra staff. Wanna join our team?! Drop by Crimson Tate at 845 Mass Ave and perhaps the next post will be a photo of YOUR staff pick bundle. Get in here enthusiastic, positive, smarty quilters. We need your help in our store!! New Session of Six Weeks of Sewing 101 ADDED!! They are all wonderful! I think Melissa’s looks most spring-y! I like them all, but my eye keeps going to David’s!! Great job gang. I think they are all great. Are you doing a challenge or just a fun thing. If I come in a buy a set or 2 and make a quilt can it hang outside of Crimson Tate? I need to see them in person to pick one. Cathy! We are just playing in here, as usual. Come hang out!!! We’d love to see you. I adore the tranquil seas of blue and greens. I could float away to an uncharted island on a quilt made from those colors. They are all fantastic but I think David’s is my favorite. I love the contrast that the black and grey provides for the bright blues. Very fun! I am always drawn to bright colors, so I pick Melissa’s. I can imagine all sorts of fun projects from those fabrics! So hard to pick. You guys all have good taste. But I keep coming back to Melissa’s. Taste the rainbow! If I lived in Indy I’d apply. My dream jobs are working at either a bookstore or fabric shop. And I’m looking for a part time job. 😉 May you get some fabulous candidates. Loved looking at the bundle challenge. You know how to have fun! Oh, I would love to work at Crimson Tate!! Someone perfect is out there, and on their way to you! You are so encouraging and lovely, Beth. Thanks for the kind words.